The Lakeview is an A-Frame Full Log Cabin with an open view wood burning stove and a large stone chimney. This cabin will accommodate 8 persons. One bedroom has a queen-size bed, one bedroom has two single beds, and the large loft area has two double beds. The Lakeview has two full bathrooms, a spiral staircase and sliding glass-doors out to the patio that looks out towards the lake. 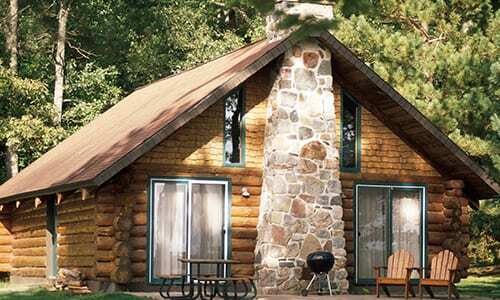 Eagle’s Nest is an A-Frame Full Log Cabin with a fireplace and a large stone chimney. This cabin will accommodate 8 persons. One bedroom has a queen-size bed, one bedroom has two single beds, and the large loft area has two double beds. Eagle’s Nest has two full bathrooms, a spiral staircase and sliding glass-doors out to the patio that looks out towards the lake. Chalet is an A-Frame Full Log Cabin with an open view wood burning stove and a large stone chimney. This cabin will accommodate 8 persons. One bedroom has a queen-size bed, one bedroom has two single beds, and the large loft area has two double beds. Chalet has two full bathrooms, a spiral staircase and sliding glass-doors out to the patio that looks out towards the lake. Lookout is an A-Frame Full Log Cabin with a fireplace and a large stone chimney. This cabin will accommodate 8 persons. One bedroom has a queen-size bed, one bedroom has two single beds, and the large loft area has two double beds. Lookout has two full bathrooms, a spiral staircase and sliding glass-doors out to the patio that looks out towards the lake.